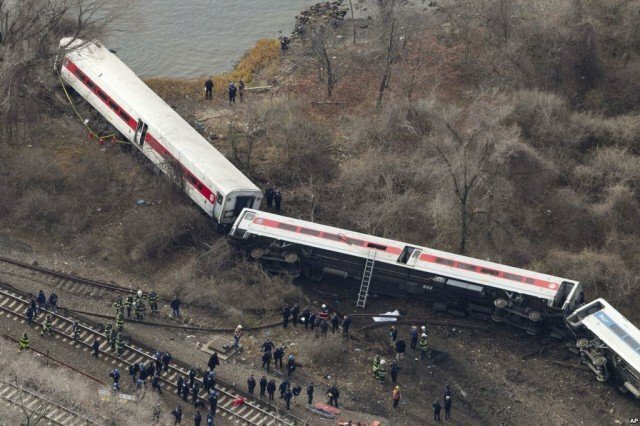 Metro-North train that crashed on Sunday in New York City was going 82 mph in a 30 mph zone when it ran off the rails, investigators have said. Four people were killed and more than 60 injured in New York’s Bronx borough. The Metro-North train from Poughkeepsie to New York City crashed about 07:20 local time on a curve. The National Transportation Safety Board (NTSB) is investigating whether a mechanical failure or human error caused the train’s high speed. The train appeared to have been travelling over the speed limit even before it thundered into the curve where it crashed – the speed limit on the track approaching the curve is 70 mph, NTSB board member Earl Weener said on Monday. He said the train had made nine stops prior to the derailment, and officials had not yet uncovered any brake problems. Earl Weener said preliminary data from the train’s event recorders indicated the train’s brakes became fully engaged just five seconds before the locomotive came to a complete stop after the crash. In addition, he said the locomotive’s throttle went to idle six seconds before the train came to a stop. Authorities continue to question the train’s engineer and three other crew members, and planned to transport the locomotive to a secure facility for further examination. Officials were examining the engineer’s mobile phone – a standard procedure, Earl Weener said. The engineer and assistant conductor were both injured in the crash. Authorities also obtained surveillance video of the derailment from a nearby bridge, but the picture was of low quality, he added. Officials have identified the deceased as Donna Smith, 54, James Lovell, 58, James Ferrari, 59, and Ahn Kisook, 35. Three of the dead were found outside the train, and one was found inside. Of the 150 or so who were on board, 11 remain critically injured. One man suffered a spinal cord injury that could leave him paralyzed from the neck down, a doctor told CNN.